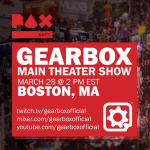 We had an amazing time at the Gearbox Main Theater Show! Gearbox Publishing is bringing the critically-acclaimed cult-classic shooter Bulletstorm to the Nintendo Switch this summer! Bulletstorm: Duke of Switch Edition will be the full single-player campaign with all of the previously-released add-ons along with the Duke Nukem DLC! New Partnerships with Trover Save the Universe and Astroneer to supply physical retail. Gearbox Publishing has announced new partnerships to help bring high-quality indie games to retail shelves. Trover Save the Universe will be released digitally and physically on May 31, 2019, and Astroneer will be hitting store shelves sometime later this year. In the first piece of handcrafted Season Pass content They Came From Below, NPCs James and Roger return in an all-new We Happy Few story. Wellington Wells stands besieged by a robot uprising, but the mechanized menace isn’t the only thing threatening to tear the pair apart. Play as Roger and team up with your boyfriend James to Find Dr. Faraday, explore a vast underground laboratory, and discover the source of the robot invaders before it’s too late! 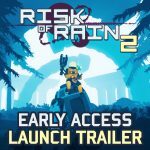 Gearbox Publishing and Hopoo Games are partnering up to bring you Risk of Rain 2. Early Access launched on Steam TODAY, with a full launch coming later this year. As part of the early access launch (for 48 hours starting March 28), players who purchase the game can gift a free second copy to a friend! Newly established Nerdvana Games worked with XYZ Game Labs and Gearbox Software to produce Tiny Tina’s Robot Tea Party, a Borderlands-themed Claptrap-building card game. Compete to build your own Claptrap, while diving into dumpsters and using abilities to ensure you’re the first at the tea party to finish building their Clappy! If you are at the PAX East event, stop by booth #24110 to pick up a copy of the game, or order online on www.TinyTinaGames.com. Borderlands now has an Official Discord! Hang out with your fellow Vault Hunters and take part in live AMAs with our Developers and Randy Pitchford! Borderlands 2 VR is Getting DLC! Earlier this month, Borderlands 2 VR received an update that included AIM controller support. This summer, the game will be getting another update people have been asking for: DLC! The DLC update will be free to everyone who owns Borderlands 2 VR. Borderlands: The Handsome Collection is getting a FREE 4K texture update on April 3rd for PC, PS4, and Xbox One.This update will add PlayStation 4 Pro and Xbox One X enhancements to Borderlands: The Handsome Collection, allowing gamers to experience both Borderlands 2 and Borderlands: The Pre-Sequel with better graphics than ever before. Gearbox and Blind Squirrel Games is bringing you Borderlands: Game of the Year on April 3rd! This release for PC, PS4, and XboxOne, will include the highly-anticipated remaster of Borderlands with upgraded textures to support 4K resolution and HDR lighting! Some of the exciting additions include a Borderlands-2 style minimap, and new character customizations for Vault Hunters! Gearbox Software, in partnership with 2K Games, announces Borderlands 3. More information to come on Wednesday, April 3rd.